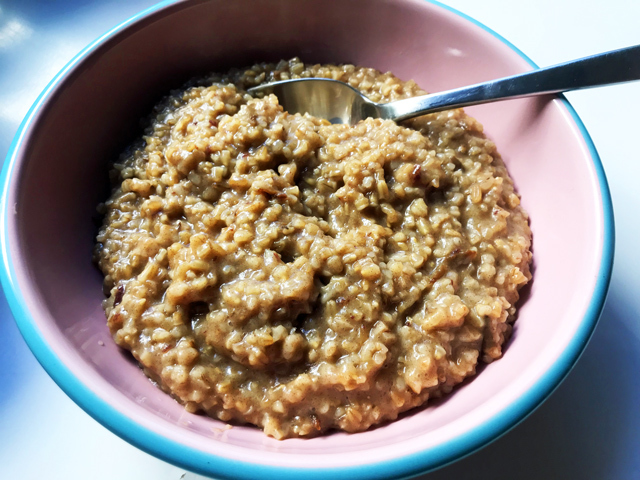 I’ve been making the same oatmeal almost every day for the past few weeks and the time has come for me to share it with you. There’s a good thing and a bad thing about this oatmeal recipe. The good thing is that it only has three ingredients, unless you also add butter (as the title above the title on this post says). 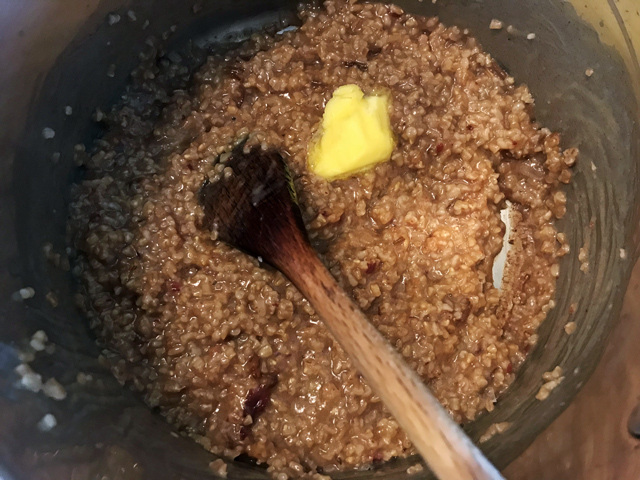 The bad thing about this oatmeal recipe is that it features the single ugliest picture I have ever taken of food in my life. You’re about to see that picture, but I don’t want it to scare you. Just imagine it like those pods in the movie Cocoon, sitting at the bottom of the pool, waiting to hatch into aliens who will guarantee you everlasting life. At least I think that’s what happens in Cocoon? It’s been a long time since I’ve seen it. Told you: it’s a deeply disturbing picture. But the idea behind the picture isn’t disturbing! It’s actually something that I’m very proud of. See, I’m aware of a few things in the health department. 1. 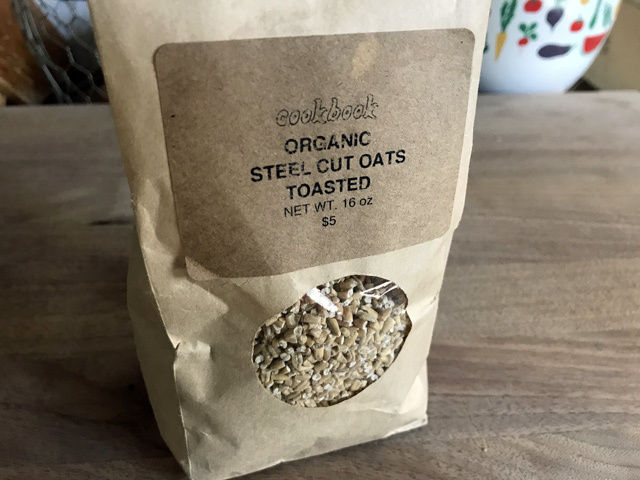 Oatmeal is good for you in the morning because it’s full of fiber, especially steel-cut oats. 2. Eating whole fruits is better for you than drinking fruit juices, which deny you all of the fibers and pulps that make fruit so healthy. So this recipe combines whole fruit with steel-cut oatmeal. As someone who prefers things on the sweeter side, it’s a great move because the dates naturally sweeten the oatmeal. Which brings us to our third ingredient: salt. 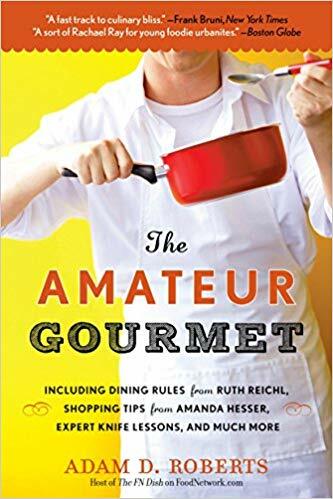 I use Maldon sea salt, which is what April Bloomfield uses in her English porridge, and that helps balance the sweetness of the dates. In fact, you’ll find the more salt you add, the more exciting the oatmeal becomes. And that’s it, those three ingredients. 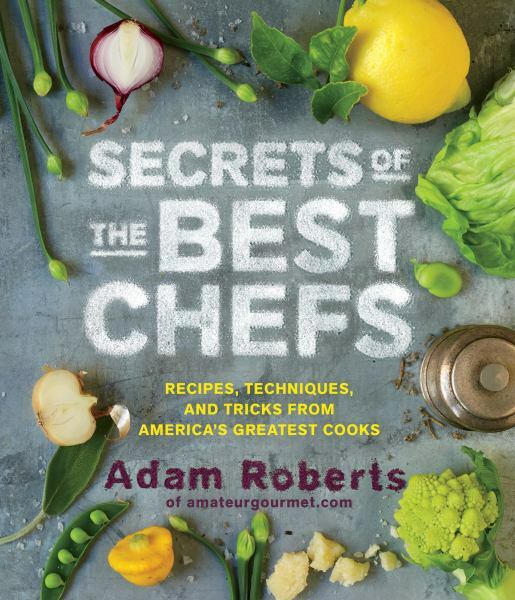 I know you want a recipe at the end, but I’m giving it to you here. (I put that in bold so you don’t miss it.) Put two cups of water into a pot. 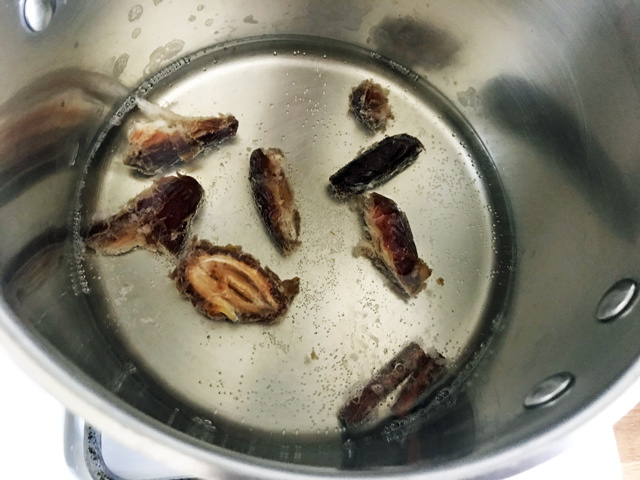 Drop in three or four Medjool dates that you’ve pitted. 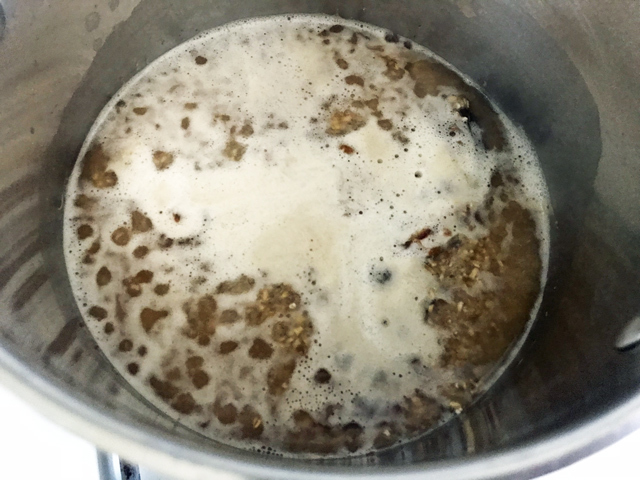 Turn up the heat, bring to a boil, add a big, fat pinch of Maldon sea salt (let’s say 1/2 a teaspoon to start), and then add 1/2 cup of steel-cut oats. Lower the heat and continue to simmer for 20 minutes or so. If the pan dries up before the 20 minutes are over, add another 1/2 cup of water, and continue to stir periodically. Here’s the cool thing that’ll happen: the dates will break apart. 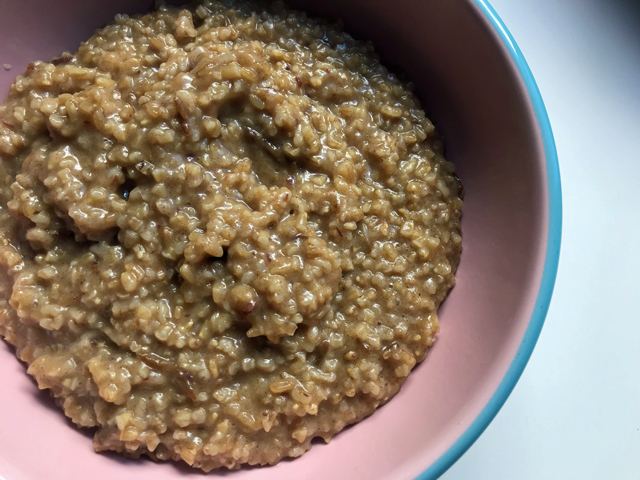 Towards the end, you’ll want to beat everything vigorously and really work those dates into the oatmeal. And then, if you’re feeling naughty, you can add a fourth ingredient: a little nub of good butter (I’ve been using Beurre de Baratte lately). Whip that in too, pour into a bowl, and there you have the coziest, most comforting, relatively healthy (butter’s OK in small doses!) oatmeal in the world. Almost worth having to endure that picture of the dates floating in water.